Allermyl SIS Shampoo is an itch-relief shampoo for dogs and cats with skin allergies. Allermyl Shampoo contains Omega-6 fatty acids which contribute to skin recovery, and monosaccharides and vitamin A help to reduce inflammation. Piroctone olamine reduces existing secondary skin infections. Allermyl Shampoo can also be used for pets with flea, food, or contact allergies. Allermyl Shampoo is specially formulated for sensitive or irritated skin. It contains a combination of soothing and antiseptic ingredients to nourish and protect the skin. 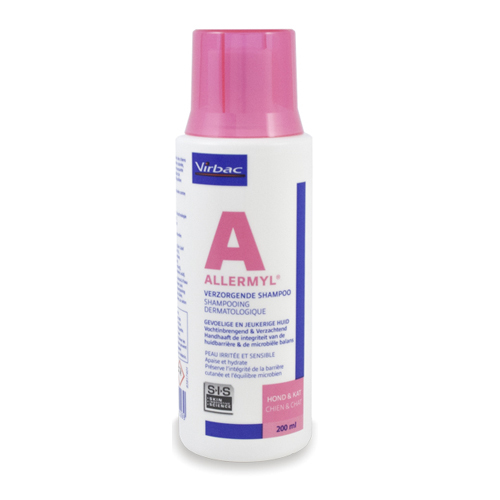 Virbac Allermyl Shampoo is a liquid shampoo, which is easy to distribute and easy to rinse out. To use, first wet the fur and then apply shampoo to your pet? fur and your hands, massaging thoroughly into the fur. Rinse, then repeat. For the second wash, leave the shampoo to soak for 5-10 minutes, then rinse thoroughly. Allermyl Shampoo can be used 2 to 3 times a week. For external use only, avoid contact with eyes and ears. If this does happen, rinse immediately with water. All of our products are sourced from genuine veterinary wholesalers in the Netherlands. Because of this, some items may be delivered in Dutch packaging. Have you used Allermyl SIS Shampoo before? Let us know what you think about this product.